Inflation rose to 3.1% in November, the highest in nearly six years, as the squeeze on households continued. The Office for National Statistics (ONS) said that airfares and computer games contributed to the increase. The most recent data shows that average weekly wages are growing at just 2.2%. Mark Carney, the governor of the Bank of England, will now have to write a letter to Chancellor Philip Hammond explaining how the Bank intends to bring inflation back to its 2% target. Mr Carney has to write a letter to the chancellor if the Consumer Prices Index (CPI) inflation rate is above 3% or below 1%. In November, the Bank of England raised its key interest rate for the first time in more than a decade from 0.25% to 0.5%. Mr Carney had said that he expected inflation to peak in October or November. The last time he wrote to the chancellor was in December 2016, after inflation fell to 0.9% in October that year. Mr Carney's latest letter will be published in February, when the Bank of England will also release its quarterly Inflation Report. It may be the highest rate of inflation for nearly six years. But that tells you not so much how high it has got but how low it has been for so long. In the past 10 years, inflation's peak has been 5.2% (in 2011). Tell anyone over the age of 50 that inflation at 3.1% is out of control and you're likely to get a scoff, followed by memories of the 70s and 80s. What they may forget, though, is that for most of that time wages were also rising - and faster than prices. The tendency of wages to respond to higher prices and outpace them seemed to follow an iron logic back then. Bigger price rises led to bigger pay rises, forcing many employers to charge higher prices to cover higher labour costs: the so-called "wage-price spiral". But those rules don't seem to apply these days. The breakdown of that logic is why we have a squeeze on living standards. It is also why the Bank of England isn't that worried about above-target inflation getting higher or even staying above target. In the City, a second rise in interest rates isn't expected until August next year. Lucy O'Carroll, chief economist at Aberdeen Standard Investments, said: "It's quite possible that inflation is now close to its peak. But some of the latest surveys suggest that service sector costs and prices are rising. Given how dominant services are in the economy, this could feed through to inflation overall. The ONS said that although airfares fell in November - down 10.4% - the decline was not as steep as last year when they tumbled 13.4%. Data also shows that food inflation has picked up, especially prices for fish, oil and fats, such as butter and chocolate. Figures from market researcher Kantar Worldpanel released on Tuesday indicated that food inflation hit 3.6% in the three months to 3 December, the highest rate since 2013. It also noted that prices for butter and fish had grown as well an increase in the cost of fresh pork. Kantar said only a few items were cheaper during the period, such as fresh chicken and crisps. 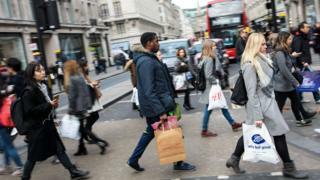 Richard Lim, chief executive at Retail Economics, said that the rise in inflation had come "at precisely the wrong time for retailers". "In the run-up to Christmas, the cost of living, now rising at the fastest rate in five years, remains uncomfortably high for households." He said that food inflation "is one of the most transparent indicators of living costs and often the catalyst to cut back on spending elsewhere". However, he expects the inflation rate to now fall and could reach 2.5% by Easter. The ONS will announce employment data for the August to October period on Wednesday, which will include figures for wage growth. Ben Brettell, senior economist at Hargreaves Lansdown, forecasts that average weekly wages have risen by 2.5% during the period. He said: "With wage growth picking up we should see an end to falling real pay in due course. "That'll be of small comfort, however, to households facing a significant increase in the cost of Christmas this year."